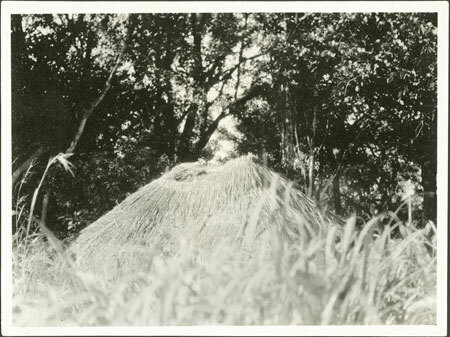 A hut (possibly a type known as basa or even basura) constructed in the bush to shelter boys during circumcision initiation. Such huts are thatched using a common grass (cogon grass) known as bingba (Imperata cylindrica). In The Azande (OUP, 1971, page 90) E. E. Evans-Pritchard notes that "[t]he hut called basa, crudely constructed, without walls, and tunnel-shaped and barn-like in appearance, is put up in the bush to shelter boys during initiation by circumcision and for meetings of secret societies (closed associations)." Morton, Chris. "Zande circumcision hut" Southern Sudan Project (in development). 03 Jan. 2006. Pitt Rivers Museum. <http://southernsudan.prm.ox.ac.uk/details/1998.341.383.2/>.